Hi, just a quick note to let you know Solomon's Grave has been officially released (well, released, I found out through Amazon because my publisher's on vacation ). If you haven't ordered a copy yet, Amazon's got it on sale for 13.57 or some such weird amount. Not sure how long the sale lasts. Haven't got my author copies yet, just the one I preordered from Amazon. Looks good! Even better, there's no author photo so you don't need to hide it from the kids. With my debut novel's release this month, I'm offering everyone a preview of the novel, opening chapters released each week. Solomon's Grave is now available for Pre-Order! Click here to order your copy now! Feel free to share, spread the word, but keep in mind, this work in English is (c) 2009 by Daniel G. Keohane, and though you may reproduce / forward it in order to spread the word, no language/wording may be changed in any way, and all must be attributed to me (by always including the "by Daniel G. Keohane" line). If you like what you read, spread the word! Vincent Tarretti leaned back in his worn recliner. He’d become a creature of habit over the years, falling into a set routine each night before bed. The chair was comfortable despite the occasional rips in the vinyl, having long adapted itself to his form. Johnson lay sprawled on the small rug in front of him, the large black Labrador content with his master’s nightly patterns. Vincent ran his stockinged feet gently across the dog’s back. Johnson wagged his tail in appreciation and stretched further out along the rug, eyes closed, already asleep. Smells of grass from this morning’s mowing drifted through the screen on the night’s breeze and reminded him, as it always did, of the childhood he’d left behind twenty-six years ago to start his life with Melissa. Even that world had been taken from him before it had barely time to begin. For the last two and a half decades, Vincent Tarretti’s life was this silent, simple substitute. Cutting the cemetery lawns in warm months, shoveling snow from the walkways or thawing rectangular patches of ground to bury the dead in the winter. His home now consisted of Hillcrest Memorial and Greenwood Street cemeteries, plus the two smaller, much older graveyards scattered across town. the Ark which housed the law of Moses and the tablets containing the Ten Commandments. It resided in the temple designed by David, but built by his son, Solomon. The same Solomon, Stephen explained in the passage, who eventually forsook the one true God in his later years to worship the local demons of the time, the deceivers. This was the second time today that Vincent wondered if God’s plan for him was beginning to change course. The first was during the call from Ralph Hayden, letting him know he’d be stopping by tomorrow afternoon with his successor. Nathan Dinneck. Vincent did not know if Dinneck’s arrival was related to his recent plague of dark dreams, details of which dissipated like the mist that hung among his cemeteries in the early morning. The only memory he could salvage on waking and carry with him during the day was a lingering, aching sense of misgiving. He used to dream a lot, when he was younger. Not long after he’d moved to this small suburb, Vincent had stopped dreaming altogether. At least he assumed he had. Maybe he’d simply stopped remembering them. Their sudden resurgence worried him. He hadn’t remained here, unfettered by anyone for so long, by ignoring his instincts. He took little credence in coincidence. That was a word used by those too stubborn to see the hand of God at work in their lives. A sudden gust of wind slammed against the house. Summer was winding down, but not without protest. He slowly rose from his chair and opened the front door. The sky was clear, a million stars above him. Wisps of clouds occasionally passed by, moving quickly as if driven by the wind; ghosts in search of rest they would never find. He watched their passage with growing apprehension, half-expecting the wisps of vapor to turn toward him, to form a claw reaching down.... He went back inside and closed the door, lest his fear be detected by whatever or whoever else might be out there, wandering around the cemetery, looking for him. Looking for what he had sworn his soul to protect. Besides, it was bedtime. Any change in routine might attract the attention of those who might someday find this place, if not in his lifetime, then the next caretaker’s. For Vincent, those people existed only in warnings from his predecessor and in the writings of those who came before. Faceless and nameless adversaries over the centuries, always searching. Never stopping. Too much at stake not to stick to a schedule, never stray. Never stray. He flipped forward until he found a fresh page, on which he wrote the number “815” followed by, “New pastor in town. Nathan Dinneck—odd to choose someone so young and from town. Hayden retiring. Timing of this with onset of sudden foreboding— see entry 811—comes into question.” He paused, then added, “Wait and see.” He closed the notebook after tucking the newspaper clipping announcing Dinneck’s new appointment inside, and laid it atop the older journals in the strongbox. He locked it with a small key attached to his everyday key chain, and crossed the room. Johnson got to his feet and followed him into the darkened bedroom. Before heading into the bathroom to brush his teeth, Vincent lifted a loose board under the edge of the bed and laid the strongbox into the floor. He replaced the board and dragged a small rug, coated in dog fur, across it. Johnson waited until his master went into the bathroom, then circled twice before settling down for the night on the rug. 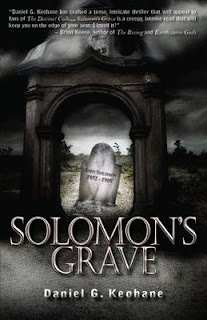 Click here to Pre-order your copy of Solomon's Grave! The Reformed Baptist church in Hillcrest was small, but its ranks still listed over one hundred and sixteenparishioners. Most lived locally or in one of the neighboring towns. The parish’s home was a two-story saltbox on Dreyfus Road, once home to the founder of the long-closed Dreyfus Shoe Company in Millbury, and his extended family. After the prestigious clan’s heyday in the late eighteen-hundreds and early into the following century, much of the sprawling estate had been bequeathed to the town. The large square home had stayed in the grasp of one family member or another through the mid-sixties until, falling too far into disrepair, it sat vacant for years. In the nineteen-seventies, Ralph Hayden and his wife Jean recognized that the population of their small parish in the city of Worcester had reached its limit. With the backing of fellow parishioners, the aging structure in Hillcrest was purchased from a grateful legal firm who had been acting as the Dreyfus Estate’s trust company. Two-thirds of the first and second floors were slowly refurbished into the main chapel, with the remaining area closed off and reserved as the new home of Reverend Hayden and his wife. The reconstruction had taken nearly a year and a half, a time of pot- luck suppers and other fund-raisers held by the Worcester congregation. The money was raised, the mortgage approved, and the long, careful renovations begun. Hayden, ordained ten years before but never having a parish to call his own, at last was able to retire from his twenty-two year manufacturing job at Norton Company and, in his late fifties, fulfill a dream. Nathan had been only three when the maiden service was held. Since then, it was the only church he’d ever known until leaving for college. Its humbleness was an anchor to the town each time he returned, second only to his parents’ house. The cab pulled onto Dreyfus Road and parked at the curb. Nathan climbed out and stretched, wishing he’d slept more. He lifted his two suitcases from the trunk before closing it, paid the fare. An old Chevrolet four-door, slightly rusted, sat in the lone parking space out front, marked with a small sign reading “Reverend Hayden.” As for the man whose name still marked both the parking sign and the top of the weekly masthead, he stood slightly bent in the doorway, watching. Nathan waved. The man had always looked old, gaunt with thin, white hair. Nathan tried to look casual as he walked to the door. He took Reverend Hayden’s hand gingerly in greeting. The pastor may have appeared fragile, but his gaze was eternally young. Deep blue, Hayden’s eyes scanned Nathan top to bottom as he feebly returned the shake. Looking for flaws, Nathan thought, a little self-consciously. Hayden waved the comment away. “Not exactly.” He moved aside to let him enter with his suitcases. “I haven’t driven in four years now, Nate, when they made me give up my license. Too afraid I might run over a flock of schoolchildren or something. I don’t know. Marcus O’Connor takes it for a short drive once a week to make sure it’s still working, God bless him. The parking spot—and the gas guzzler—are yours now.” He said this with a sly grin as he closed the door. Nathan smiled back. The pastor enjoyed instilling terror in the hearts of the children with his gruff, mess-with-me-and-you-mess-with-God personality. Being his apparent successor (there was no “April Fools” sign on the door, Nathan was relieved to notice), he now found this attitude amusing. But Hayden cut him off with another gesture of his thin hand, this time accompanied by a wide, slightly yellowed grin. The expression was warm. “I’m sorry, Reverend Dinneck,” he said, moving in front of him with a pat to his arm. “Old habits die hard, and,” he coughed a little in what Nathan thought might have been a laugh, “you should have seen the look on your face.” He laughed more clearly this time, and Nathan joined him, though slightly more guarded. Old habits, he thought. After spending years, literally, on the maybe list of two major magazines (one of them ended up folding, I finally pulled it from the other), my rather surreal story "Family at Dinner" was accepted last year by Tim Deal for publication in his slick new horror magazine Shroud. This relatively new print mag has been gaining quite a reputation lately. 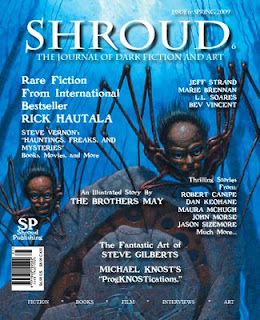 Issue 6 will be the first for Shroud's new major distribution program, so the magazine should be available at most every Barnes & Noble and more! Check out the cover and line-up of this issue, L.L.Soares, Rick Hautala, Bev Vincent, and a ton of other incredible writers and friends. This one's going to be very cool. I'll let you know when it's in the stores! With my debut novel's release date set for this month, I'm offering everyone a preview of the novel, the opening chapters released each week. Feel free to share, spread the word, but keep in mind, this work in English is (c) 2009 by me, Daniel G. Keohane, and though you may reproduce / forward it in order to spread the word, no language/wording may be changed in any way, and all must be attributed to me (by always including the "by Daniel G. Keohane" line). If you like what you read, spread the word! The sky above the desert glowed deep red, almost maroon. Toward the horizon, it became brighter, lightening to a thin yellow where sand met sky. Nathan didn’t know which direction this was, whether he was seeing sunrise or sunset. He prayed he was facing east, for then the dancing colors would imply the sun would soon rise and with it, the comfort of day. Desert stretched around him as far as he could see, but he was not hot. No shimmering of heat danced over the ground. The sand under his sneaker felt real when he kicked it. When he looked up again, his stomach tightened—a thin, acidic fear creeping through his body, filling his arms and legs with lead. Where once there was only an eternal stretch of sand before him, a building now stood. Even from this distance, he could tell it was massive; two hundred feet high, maybe more. No definite delineation existed of floor or stories. It could have been a pyramid—its base wide, slowly tapering to a narrow girth at the top—or an Incan temple the likes of which he’d seen in old National Geographic magazines. He was dreaming, a realization as familiar as the dream itself. As before, with the introduction of the temple came the people marching past. They formed a long line on either side of him, hooded, cloaks bathed in red hues of the surreal sky above. They marched in the sand like penitent monks, toward the temple. Nathan did not want to follow. He wanted to run away, or wake up, or do whatever he could to escape. The sand pulled him forward like an undertow. He tried to maintain his footing. The sand did feel hot, piling over his socks and sneakers. He tried to lean back, pull against the force. Then he was in the air, flying without effort toward the temple. He passed over the hooded figures as they trudged along the landscape toward hundreds of steps leading up the building’s face toward a single, massive door. In the crowd that raced past below him, one face—just a quick glimpse—rang familiar before being lost in the ruddy shadows of its hood. The face eluded his memory, his thoughts occupied now on what lay ahead. The doors of the temple swung inward. What remained was only a black square waiting to swallow him. Nathan spun, looked behind him to search under the cowls to glean any features of a friendly face. Someone to beg help from. Nothing but lonesome darkness under each. If there had been someone he knew in the line of penitents, that person was lost forever. The twin formations faded into the distance. He was moving backwards, toward the open doors of the temple. Nathan ineffectually kicked his feet, tried to swim away in the hot, dry air. He remained caught in the undertow, sensing a heavy presence in the doorway behind him. He didn’t want to turn around, didn’t want to go inside. He closed his eyes, curled himself into a tight ball, tried to scream, tried to wake up, but his voice was mute. “You are the sacrifice tonight,” said a voice. It was the voice one would imagine belonging to God, but turned inside out, dark and amused. From everywhere and nowhere a hundred arms grabbed him, squeezed his skin, pulled him inside. Nathan found his voice at that moment and screamed one long, desperate wail. He struck out, found his arms no longer pinned. A large, burly man leaned across the aisle and gripped his shoulder. Despite the man’s size, he seemed afraid to touch Nathan. “It’s OK, man. You awake yet or what?” He pulled his hand away and leaned back into his own seat. Nathan looked around. The steady vibration of the bus, rolling along the dark highway outside. The bus. He’d fallen asleep on the ride. Nathan checked his watch, pressing a small button to illuminate the dial. Two-thirty in the morning. The other man’s body sagged with relief, and he nodded, moving his large frame back to the window seat where he’d apparently been sitting before coming across to pull Nathan from the nightmare. “It’s OK,” he mumbled, keeping a sideways glance trained on him. “Didn’t hurt. Sounded like a bad one. I couldn’t wake you up.” He made this last statement almost to himself. Nathan began to explain, but already the images and details were hard to remember, washed away in the real-life sensations of the bus’s dimly-lit interior. Besides, the guy probably didn’t want the details. He was being polite. “I don’t remember much of it, not really. Thanks, though.” Three other heads were looking over the backs of the seats from scattered locations in front of him. Another advantage of taking such a late-traveling bus—aside from getting to Massachusetts quicker and without traffic—there were far fewer passengers spooked by his outburst. Nathan wondered absently if he really had screamed, or if that had been part of the dream. He didn’t want to know, and didn’t ask. The man across the aisle extinguished the small overhead reading lamp, obviously trying to get back to sleep. Nathan’s left shoulder ached. The guy must have shaken him hard. Seeing nothing else to hold their interest, the observing heads moved out of sight behind the seats. Nathan was alone again. He looked at his dim reflection in the bus window, broken occasionally by a passing headlight or street lamp along the edge of Interstate 95. He tried to capture some details of the dream, hoping to retain more of it this time. It was his second nightmare this week. Some details felt familiar this time around, as if he’d experienced them before. Same dream, probably. The temple was most vivid, so alien to his consciousness. Maybe he’d seen it in a book, once, but couldn’t remember. Its setting had a biblical flavor. Nathan had already checked the three versions of the Bible he owned and didn’t see any illustration coming close. This time, there had been a familiar face in the dream, or at least he thought so. His father, maybe? Other details, the red sky, the desert-scape, but again he returned to the quick glimpse of Art Dinneck—if that’s who it was—walking along, hooded, lost. Almost reverent. That part almost made sense. Homecoming jitters. In a few more hours, he’d arrive in Worcester. Then a cab ride to the small town of Hillcrest fifteen minutes north. Not to the house of his childhood, though he would pay a visit to his parents later. Tomorrow morning—this morning, he realized—Nathan Dinneck would step into Hillcrest First Baptist Church not as a parishioner returning to the fold, but as its new pastor. The prodigal son returning, as his mother enjoyed saying (and saying, and saying) since he’d first phoned with the news. Only the second minister to serve in the small church’s thirty-year history. His new job broke so many rules of a parish choosing a pastor, he half-expected a large “April Fool’s” sign taped to the door. Five months late for such a thing, granted, but a nagging uncertainty remained. Maybe if he were older, more experienced, then his new assignment wouldn’t seem so unlikely. But Jesus’ words—that a prophet is never welcomed in his home town—weighed on his thoughts. In fact, those words were often a standard by which church elders based many a decision. Until now, it seemed. But, Reverend Hayden himself had invited Nathan to interview. The old man had been looking forward to a long overdue retirement. His failing eyesight and chronic arthritis had finally won out. Being the head of the search committee, he’d made the initial call. Nathan was serving as associate pastor in a large parish just outside of Orlando, a far cry from Hillcrest’s smaller, more intimate congregation. Unlike the south, the Christian population in New England, especially Massachusetts, was predominately Catholic and Congregational. Many of his boyhood friends went to Saint Malachy’s in the center of town, if they attended church at all. Perhaps that would be an advantage. Running a small parish in such a sleepy town meant he could get his feet wet as pastor a bit more leisurely. From his own experience, nothing much exciting ever happened at home. God had a plan for him, and that plan involved coming home. He closed his eyes, feeling the tug of sleep returning, and wondered if Elizabeth O’Brien still lived in town. If she did, he doubted she’d speak to him, big time pastor or not. He did fall asleep, and did not dream. At least not that he could recall in the light of morning as the bus pulled into the Worcester depot.